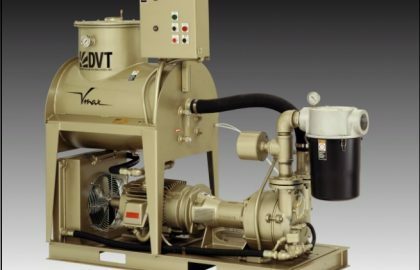 Wintek has supplied over 200 vacuum systems for use on extruder venting applications and supplies vacuum systems to several of the largest extruder manufacturers. Vacuum systems can range from simple once-thru or Full Recovery water liquid ring vacuum systems operating at 20″HgV to more sophisticated higher vacuum systems complete with Knock-out Pots, Condensers. Carryover is always a concern with extruders, so most systems are liquid ring vacuum pumps with inlet strainers, filters, or inlet Knock-out Pots. Much less frequently Once-thru-Oil vane pumps are utilized. Full Recovery Liquid Ring w/ inlet basket strainer and removable top separator. Thermoforming requires rapid evacuation to a deep vacuum while the plastic sheeting is still hot. Too slow of an evacuation will result in improper corner formation. To keep the equipment costs to a minimum, this is accomplished by using a vacuum balancing tank with automatic valves and a properly sized vacuum system, based on cycle times. Wintek has supplied many systems on thermoforming, both dedicated vacuum pumps and central vacuum systems. Pumps are typically either rotary vane or oil sealed liquid ring vacuum pumps.